Mazars Transaction Services offer vendors, purchasers and financiers all the necessary skills and expertise to serve every aspect of their transactions. Combining financial expertise with commercial acumen, our multi-disciplinary teams target business drivers, balance sheet pillars, key management, key relationships and taxation to provide insight which is critical for transaction decisions. Be it buy-side or sell-side, our due diligence professionals are equipped with in-depth knowledge and experience that enable business-oriented analysis of all sizes of targets in different market sectors and geographies. At Mazars, we believe that due diligence should not be treated as a commodity. 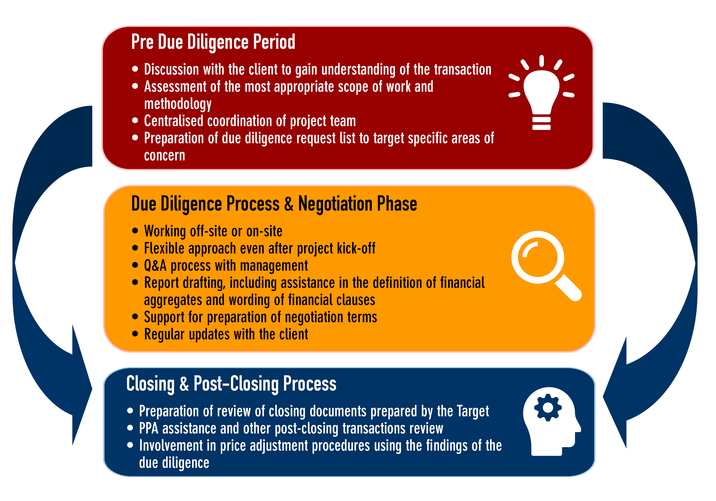 Each due diligence project is planned to ensure all key aspects (valuation, drivers, risk areas etc.) are well-thought-out. Mazars’ Partners tackle each project with a “hands-on” approach, ensuring that our clients can expect high level of expertise throughout the project. Our team of dedicated professionals possess the skills to uncover the unexpected and pick up issues with ease to share them with other advisors and in-house project teams. Mazars’ unique cross-border integrated partnership and strong inter-personal relationships is one of the key factors which will provide successful project coordination. To avoid potential independence issues, it would be unusual for Mazars to take on both the advisory role and provide due diligence services. We also perform global conflict checks for all assignments.